The Scholastic Book Fair, which will support the library and teacher classrooms, will be held February 5-7 in the Metcalf Library. Times are listed on the Metcalf calendar. 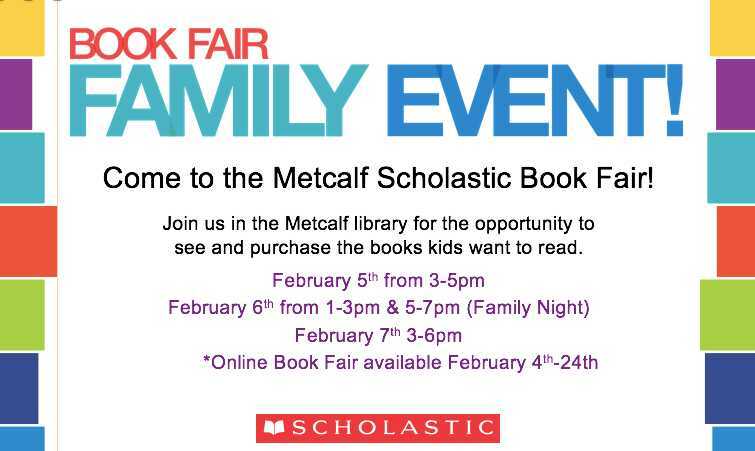 On Wednesday, February 6, we will be having a special family night where the library will be open for shopping from 5-7 p.m.
Our Scholastic fair homepage can be viewed here. We are so excited to welcome Scholastic and look forward to seeing you at the book fair!